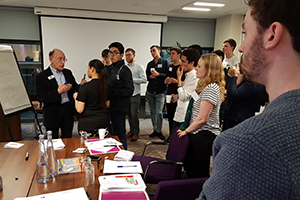 Sheffield Engineering Leadership Academy: Networking 101: We've been Kintished! Networking 101: We've been Kintished! On Wednesday afternoon, I participated in a SELA workshop led by Will Kintish on the topic of Networking. Going into the workshop I had little understanding of what networking was and even less so about the importance of networking events. Due to my lack of knowledge, I feared it was going to be a long afternoon answering questions about something I had little idea about. 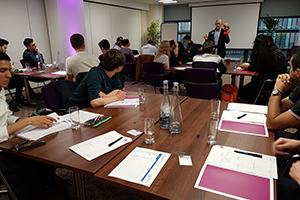 However, by the end of the session my worries had been addressed and I now feel confident, well informed and excited about future networking events. Will began by discussing the importance of LinkedIn. I’d started the process of setting up an account but never understood its use capacity and therefore never completed the process. After being informed of the potential benefits of having an account I was keen to set one up as soon as possible. Connecting with Will on Linkedin would allow for the opportunity to communicate with over 8000 of Will’s other links. The saying “A friend of Will’s is a friend of mine” kept running through my mind when reflecting on the whole process. Will went on to describe what networking events are, how they’re run, and their benefits. My main concern was that a large part of events is having keep a conversation going with strangers who could judge you based on that conversation. However, Will went around the room asking everyone about their biggest worries and I found that I wasn’t the only who was worried about having to talk to strangers. Will had assumed that this would be one of the main worries and addressed it with a number of different pointers and key questions to ask. A useful diagram was included a car (How was your journey? ), next to a house (Where are you from? ), with a business card on top of the house (Career? ), with an airplane flying past (Have you been travelling? ), with tennis racquets as propellers (Any hobbies or sports?). These were used as handy reminder for topics of conversation that could be used when talking to strangers. Lastly, Will took us through a few techniques which he described as “working the room”. I discovered that there was a maximum of six different types of groups possible in a room full of people which included an open two, a closed four and a single person group type. Some groups are approachable and others aren’t, it just depends on how the groups are positioned as to know whether to join or not. Overall the experience was an eye opening one. What was great about the session is that in learning to network you found that you were able to draw on skills you've developed through other SELA activities.